It’s a sunny day in Hebron. We walk down Shuhada Street, the once-bustling main drag running through the Casbah. The street is deserted, the shops welded shut. Amid the broken windows, olive trees, and piles of debris, soldiers stand in pillboxes on the corners and run group patrols through the streets. Arab children wave down to us from their windows, unable to walk on the restricted streets below. 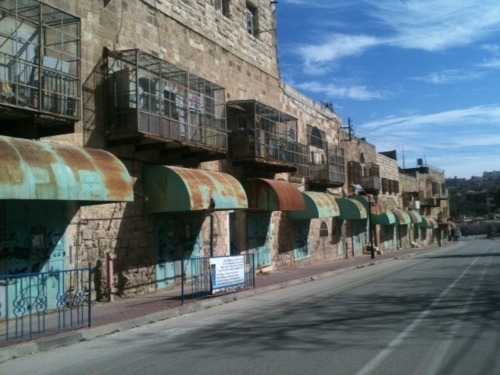 Shuhada Street, with sealed stores and caged windows, to prevent settlers from throwing stones and garbage at the windows of Arab houses. I walk through the streets of Hebron on a tour with Breaking the Silence, an Israeli organization of former IDF soldiers who served in the West Bank since the Second Intifada. Through oral histories, Breaking the Silence reveals the realities of the military occupation of the territories to open up public debate. In addition to publishing books of testimonies, they incorporate their oral histories into walking tours of Hebron, in which they share their personal experiences to illustrate Israel’s military policies. In a country where outsiders constantly come in fiercely advocating for change on one side or the other, Israelis often brush aside criticism. What makes Breaking the Silence so unique for Israel is that its oral histories are self-generated. As Avner Gvaryahu prefaced his talk at Columbia University, his engagement with Breaking the Silence stems from a love of his country and community. Such a controversial organization demands this disclaimer. In a country where the military as an institution is so highly esteemed and plays such a critical foundational and socializing role, these testimonies are truly groundbreaking. The military has ensured Israel’s continuity almost every decade since its establishment. Almost everyone knows someone who has died in the army, and almost everyone has served in the army. Much of the power of these oral histories comes from their being told by soldiers who served—not by the settlers, Palestinians, peacekeeping forces, or activists. The Israeli army has never seen such systematic and large-scale criticism from Israelis. And as more soldiers come forward to share their testimonies, their experiences become less isolated incidents and more reflective of a norm, making them harder to ignore. The success of Breaking the Silence has laid the groundwork for others to share their stories. This past year saw the release of Gatekeepers, a documentary film of oral histories with the former heads of the Shin Bet, Israel’s internal security service. In this Academy Award Nominee for Best Documentary Feature, their testimonies recount and analyze their leadership of the Shin Bet, leading them to reevaluate their strict policies and actions to advocate a conciliatory two-state solution. Those featured are the ultimate insiders; their success in speaking through their own experiences demonstrates the power of insider advocacy in oral history. What becomes apparent in these testimonies is the highly political use of language in war. Throughout Avner’s talk at Columbia and the testimonies, the processes of war are obscured with language: “Prevention” or targeted assassinations, “Straw widows” or takeovers of homes and public buildings, the “Civil Administration” or the body charged with controlling the residents living in Area C regions, a “bee nest” or a Palestinian home, a “security barrier” or a fence, a “crossing” or a checkpoint. The language teems with euphemisms, statistics and dates, maps and army divisions, permits and zones. This terminology covers the realities of the occupation. Juxtaposed with the passionate testimonies of Palestinians and settlers, it feels disconnected and objective, a stance needed for soldiers to continue functioning as a part of the system. The oral histories of Breaking the Silence leave behind much of this obscuring language as former soldiers bring themselves back into their narratives and critically reevaluate their role. This process is mirrored by the larger Israeli society as it begins to question the toll the occupation is taking on their society and their children, subjectively relocating themselves in The Conflict. Thus, beyond providing first-hand accounts of the realities of the occupation, these oral histories allow for a broader analysis of the power of language in shaping perceptions of war, of The Other, and our implication in The Conflict.